The TLBAA has always valued its youth, and through the years, has held many programs and activities for the younger generation. 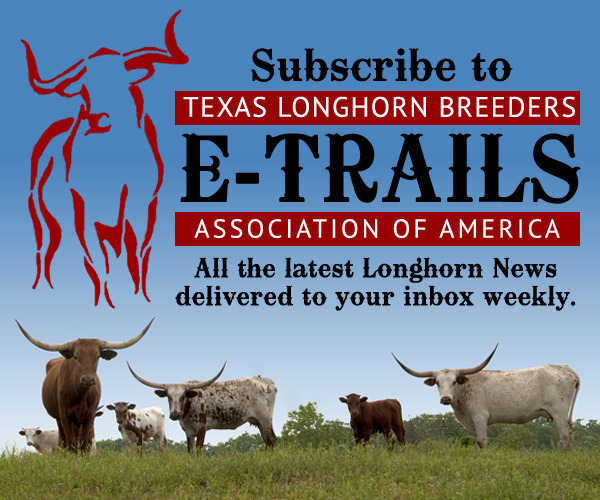 However, it was not until January 22, 1983, that the present Texas Longhorn Breeders of Tomorrow was formally created. At that time, Dr. L.V. Baker was TLBAA president, Charles Dooley was Executive Director and Gary Henry was the Youth Director. There in the Denver meeting, the TLBT name was officially approved. Shows were to be in two divisions–owned and nonowned cattle, a sale would be held at the National Youth Convention, plus an essay contest, public speaking contest and a Merit Award. 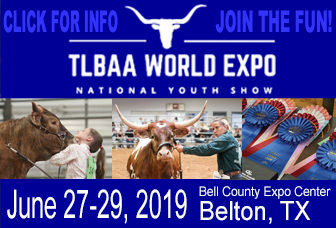 The 1st Annual TLBT National Show and Convention was held June 3-4. 1983, at Wilford Fultz’s “Little Bear Ranch” in Cresson, Texas. There were over 100 entries, with 25 different youngsters ranging in age from five years to twenty years showing. The activities included shows for owned and nonowned heifers and bulls, a showmanship contest, and a sale for the youth who wanted to sell their cattle. The afternoon was topped off with a Chicken Flying contest (whatever that is) that raised $900 for the TLBT. The National Convention was held at the Green Oaks Inn in Fort Worth. Rather than electing officers, the attendees elected a Council of five members: Dena Bartnicki, Aquilla, Texas; Mike Doak, Fort Worth, Texas ; Debbie Dooley, Crowley, Texas; Melinda Henry, Stephenville, Texas; and Lee Smith, Fort Worth, Texas. The exhibitors at the first show were Frank, Bart & Tana Whipps, Leah Ledbetter, Charles and Laura Nance; Gayle, Jason, Zanna and Katherine Sullivan; Dan, Doug and Debbie Dooley, Shawn Garnett, Melissa Chadwell; Michelle, Richie, Kevin and Nick Blevins, Melinda Henry, Kim Nietenhoefer, John T. Baker, Laquitta Hicks, Cori Slakey, Mike Doak, Edwin and Charles Ellison; Dena Bartnicki, Darren Dickson, Derric Donaldson, Matthew Schierling, Bryan and Eric Glover, Barbara Densford, Cory Wright and Stephanie Rogers.